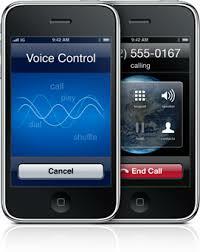 By far one of the most useful features in the iPhone 3G S 3.0 is Voice Control. If you didn't read or skim the iPhone .PDF user manual then you may have missed this feature unless you are one that like to uncover the the new features in your iPhone like you are playing a adventure video game or by after hours cocktail conversation. First of all, when driving your car in states like California which require you to use a headset, this is a great feature. You can finally place a call from your iPhone without looking at it and driving. Here is a list of the iPhone Voice Control Commands. Hold down the iPhone Home button for 2 seconds. Shuffle - to shuffle the playlist. Who is this song by? Help - the only commands for now are "Using iPhone Voice Control you can tell iPhone to call contacts, play albums or play playlists. Caveat Emptor or let the buyer or user beware - In testing iPhone Voice Control 1.0, if the voice recognition system can't decipher your your command, it will sometimes randomly start calling someone in your address book. This doesn't work like the voice calling system in most cars which require you to acknowledge each entry, it is much more predatory. In my case, it started calling several people I haven't spoken to in years that are listed in my address book. In any regard, great job Apple, can't wait for Voice Control 1.1 or 2.0. Lastly, if you are looking for Voice Control in your iPhone 3G, it's only available in the iPhone 3G S. Ugh, possibly a reason to upgrade! And it iPhone Voice Control doesn't currently work with Bluetooth. It is rumored to be in the 3.1 firmware update! :( Just bought the 3G 4 months ago. Will need to wait till Nov '10 to get any kind of discount.